We are constantly on our feet ‘day in day out’. We walk and run on many different surfaces both hard and soft. Sometimes we need to stand for very long periods. 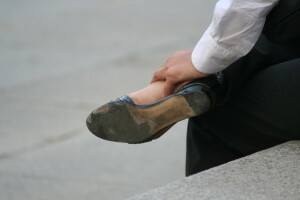 People wear ill fitting shoes or too tight a pair of shoes. Some people choose to wear the same shoes most of the time. There are some people who neglect their feet and never pamper them. Indeed, our feet really do take a great deal of punishment. This is when the following common ailments can appear – see below. Corns These are small circles of thick skin. They can occur anywhere on the foot but usually develop on the tops and sides of the toes or on the sole . Calluses These are hard, rough areas of skin which are often yellowish in colour. These can develop most often around the heel area or over the ball of the foot. Fungal Nail Infection The main symptom of a fungal nail infection is the thickening and discolouration of a nail. This is a very common problem. The infection can spread quickly to other toe nails. Ingrown and involuted toe nails This ailment occurs when the side of one toenail begins to grow into the flesh of that particular toe. It is also known as onychocryptosis. High Risk Foot This is a general term used to describe a variety of foot problems mainly related diabetes mellitus. Athletes Foot This is a fungal infection which is common. It appears as a red rash, located in the spaces between toes . It is also known as Tinea Pedis. Verrucas This ailment appears as a small, rough lump commonly developing on develop on hands and soles of the feet. Verrucas are caused by an infection - the human papilloma virus or HPV. I can provide various forms of treatment to deal with these types of common foot conditions. I also provide a ‘General Foot Maintenance’ service which involves cutting and filing of nails, removal of excess skin or smoothing of roughened skin. The final stage of this maintenance service is the application of moisturising cream through a gentle foot massage. *photography courtesy of Ecerroni on Morguefile.